Drumsticks are meaty yet less oily and nutritious with high protein contents. This chicken meat cut is great for everyday cooking. 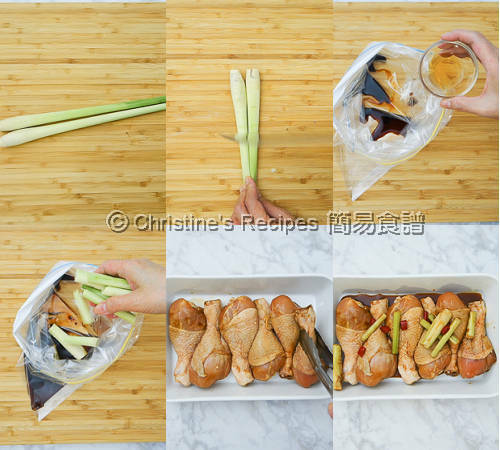 I tried baking these drumsticks with lemongrass that helps bring in a refreshing fragrance. This is a no-brainer recipe. 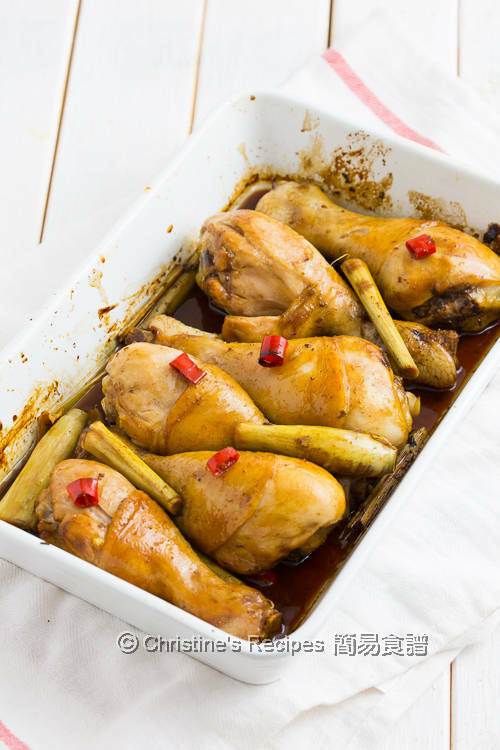 Just mix the drumsticks with marinade for enough time, then pop in your nice and hot oven. You can sit back and relax then. 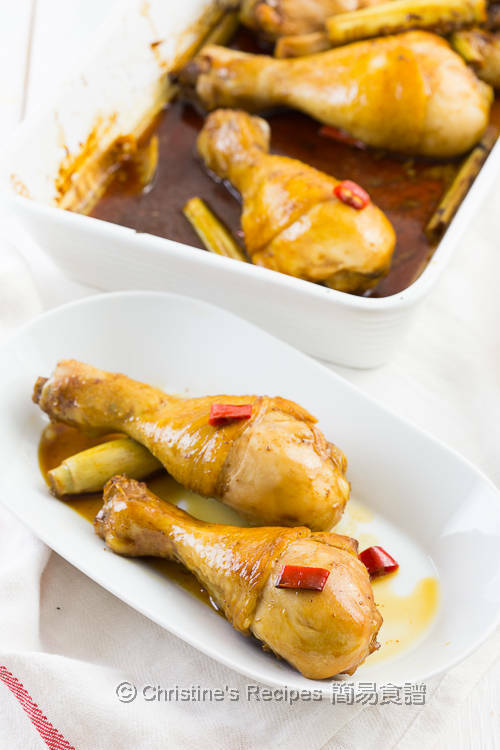 A dish of fragrant, juicy, tender drumsticks are ready for you to enjoy within an hour. I often use a ceramic baking tray whenever I bake meat as it helps retain more juice and the baked meat won’t dry up too quickly and easily. Or you may use oven-friendly glass tray instead. A heavy-based metal tray which conduct heat evenly is also not a bad choice. But you have to keep close eyes on the meat and prevent the meat from being burnt. You won’t get wrong otherwise. Rinse drumsticks and wipe dry. Set aside. Cut and discard the green part of lemongrass. Pound the white part to help release its aroma. Roughly chop. Cut red chilli into sections. Set aside. Put all the marinade ingredients in a food-grade plastic bag. Put in the lemongrass, red chilli and drumsticks. Marinate for at least 3 hours or over night. Preheat oven to 180C / 350F. Lightly grease a ceramic or glass baking tray. Put the drumsticks in one layer. Pour all the marinade onto the drumsticks. Bake in the preheated oven for 40 minutes. After 20 minutes, flip the drumsticks to the other side and continue baking until cooked through. Turn to the other side again and bake a further 5 to 10 minutes. Serve hot. Fish sauce is available at Asian grocers. Every brand has different levels of saltiness. Please adjust the amount accordingly. Close attention is needed while baking as honey is in the marinade as you don’t want the dish burn. I love the use of lemongrass here..the drumsticks must have tasted really great! Your food maybe delicious, but why use plastic bag to hold the seasoning? Why create more garbage? Yes, we're all guilty of producing more and more garbage. Lucky that we now have plastic bags that can be recycled. That's the one I used. As far as I'm concerned there are biodegradable plastic bags available out there in the market, you may use them if you like.